SEAN NEGRETTE CLAIMS HIS FIRST YOUTH RANKING TITLE! The Youth Academy has been progressing immensely with the young talent is it producing. We are now seeing other players emerging to the top flight of youth darts. 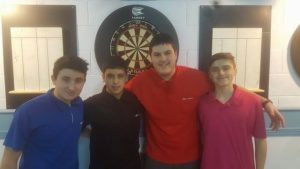 These ranking competitions determine who qualifies to be part of the Gibraltar National Youth team which will take part at the Youth European Cup, the team consists of 4 players and the top 4 of the ranking list will make it into the squad. In the first round of the competition we saw some thrilling games with Sean Negrette whitewashing the current Youth National Champion Craig Galliano 2-0 in a brilliant fearless display. Newcomer Liam Asquez almost produced a massive upset just losing 2-1 to the x2 ranking winner Ethan Smith. We also witnessed one of the youngest player Joseph Borge defeat a senior youth player in Jayc Alecio 2-1 in what was a major shock. In the quarters Jerome Duarte managed to knock Justin Hewitt who had won the previous ranking title out of the competition with a 3-1 win. Ethan Cleverly put in a solid display to take out Jospeh Borge 3-0. We also saw both Sean Negrette and Ethan Smith win their respective games 3-0 with relative ease. In the Semi’s we saw Sean Negrette defeat Ethan Smith 3-2 in what was a very tight match. Ethan Smith managed to hold onto the match with a 180 in the fourth leg which eventually equalized the game 2-2 but it was Sean who was quick to respond in the decider booking his place in the final. The other match up was a more one sided affair with Jerome Duarte taking out Ethan Cleverly 3-0. Jerome managed to perform to his brilliant best in this game against, Ethan Cleverly who had hit a total of x4 180s warming up prior to this game. 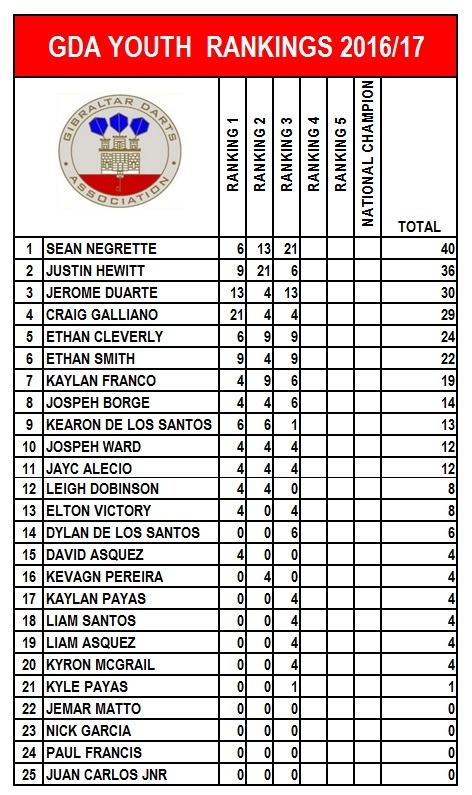 Sean Negrette managed to beat Jerome Duarte in what was of the most unpredictable games. Both players kept breaking each other’s throws. There was a total of 3 180s in the final. The most important of which was Sean’s second which gave him a chance in the final leg which saw Jerome in pole position until he produced the maximum to give himself a shot at a double. He then took his chance winning his first title and which now makes him the current Gibraltar’s number one youth player through the Ranking System. Below is the updated Ranking table with three rankings played so far this season.